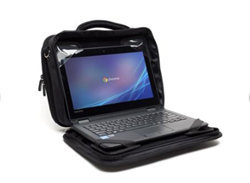 Sunrise Hitek debuts their next generation Rugged Laptop Case for laptops and Chromebooks. The new model features AlumiShield; a revolutionary design feature that virtually eliminates broken screens from external impact. Sunrise Hitek seek out feedback from K-12 experts ranging from principals, teachers and administrators to create products that are intuitive and designed specifically for the K-12 environment. Sunrise Hitek has added a next generation to their popular Rugged Laptop Case. The second generation included features such as the movable PERFECT FIT™ corner pockets for secure hold as well as an asset tag window and convenient accessories pouch, carry handle, and shoulder strap. While the new third generation hasn’t removed any of the previous attributes, some exciting upgrades have been added. HITEK’s third generation Rugged Laptop Case has the same “always-in” design with proprietary Cooling Channel™ technology that allows the computer to be used without being removed from the case along with some exciting new features. The revolutionary AlumiShield plate in their G3 bag offers unprecedented protection and virtually eliminates broken screens from external impact. Also offers universal compatibility with Apple, Dell, HP, Lenovo, Acer, ASUS, Toshiba, Samsung, and all brands of laptop computers. Back in 2014,a HuffPost article reported that within 5 years, kid’s breakages had resulted in $2.8 billion in repair costs. Since then, the frequency of children using these devices has gone up astronomically, as have breakages. HITEK cases strive to solve that pricey problem. Sunrise Hitek seek out feedback from K-12 experts ranging from principals, teachers and administrators to create products that are intuitive and designed specifically for the K-12 environment. These cases conveniently fit into the Mobile Charging Cart with charging capacity of up to (32) total devices at the same time. Each slot measures 1.625"W x 16.3125"D x 12"H and fits most laptops and Chromebooks up to 15", and all tablets including iPad Pro™. While the 32 capacity is a given, dividers can be skipped to accommodate wider devices and a separate shelf stores power adapters and cables with cable management for easy charging and is height adjustable to accommodate device requirements.